Recently, Broadway Books, (part of the Crown Group, a division of Random House), launched an innovative marketing strategy to promote David Bach’s new book Fight for Your Money which uses Facebook and Twitter as an integral part of its campaign. 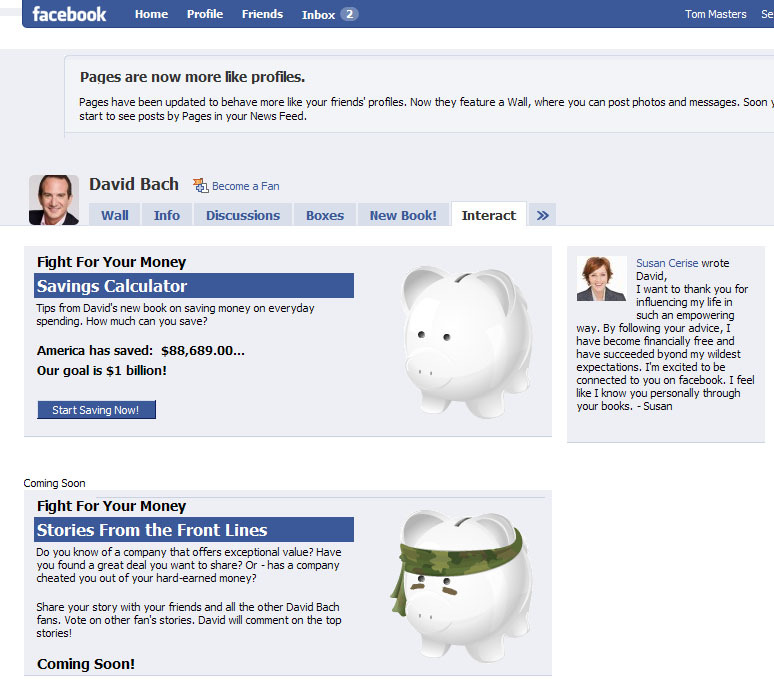 The Facebook page created around the title offers a hybrid of standard Facebook functionality – e.g. discussion forums, video and picture albums – but also custom applications for free chapter previews, pre-ordering the book, as well as applications that integrate with the book content. For example, there is a ‘savings calculator’ that tracks users’ savings based on tips from the book and generates viral messages throughout the reader’s network of friends whenever money is saved. The strategy was engineered b Vidar Brekke , the CEO of Social Intent, and his team at Social Intent. The company is a social software studio serving marketers with social networking strategy and application development. 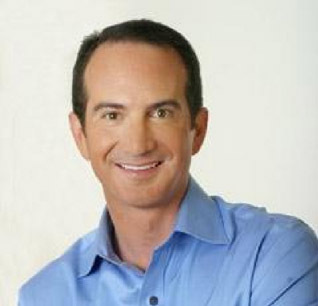 Previously, Mr. Brekke served as a VP Marketing at JPMorgan, Strategist with Ogilvy and VP Marketing at Linkstorm. We talked with him about the Random House project and his views about social media marketing for book publishers. FPP: You mention that your company, Social Intent, is a “social software studio.” Can you give us an example of that? VB: Web 2.0 was not just a seismic shift in technology (video, mobile, blogs, micro-messaging, etc.) and user engagement models (social networking, viral, peer-to-peer, etc.) but it brought a new cast of customer characters onto the stage – the networked user, the user-broadcaster, the activist, the tastemaker, the activist, the stalker, the crowd, and so on. Catering to this new audience has also created a new cast of service providers; technologists reinventing themselves as marketers, and marketers turning technologist, PR specialists becoming social relations specialists. It was, and still is, a big social science project where the sheer number of factors in flux makes it hard to understand cause and effect – and neither traditional marketers, PR pros nor technologists (no matter how much they desired to reinvent themselves) could completely grasp what was going on. At Social Intent, traditional marketers, strategists, technologists and user experience professionals have shed their labels and looked at this new world with fresh eyes and found ourselves back to basics. It’s about people and their relationships to others, and it’s about using technology to create new experiences that cater to basic human needs for recognition, self-actualization, being included & staying informed. That’s what makes software social. FPP: How did your team hook up with Broadway Books? VB: David (who already had a passionate and loyal following) had been looking for the right social media tools for his Finish Rich community for some time. He introduced us to Broadway, and together we worked up a plan to make Facebook a key part of the release strategy for the book. FPP: Can you describe the Facebook application you created for Broadway Books? VB: As social media specialists, it was our task to take our customer’s ‘social intent’ and craft a strategy that aligns their marketing goals with social networking best practices. A key differentiator for us as an agency is that we truly believe that social networking is the new customer relationship management (CRM). 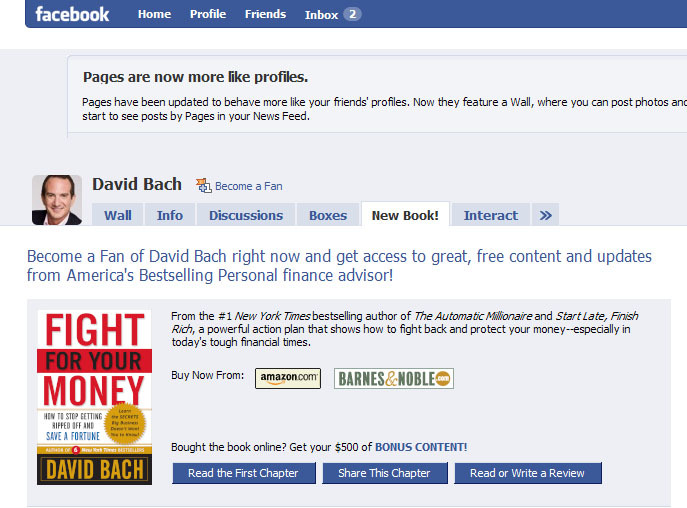 Thus we set out to develop a Facebook presence for David Bach that, while serving the short-term goal of promoting his new book Fight For Your Money, also created a sense of community among his fans that would thrive between book releases. We tell our clients to also look at their social media investment as a product extension. Customers should get additional value from engaging with the brand via social media; prospects should get to sample what the brand is all about, be it utility, fun or anything in between. When marketers help people achieve their goals, people will return the favor through both evangelism and purchase. 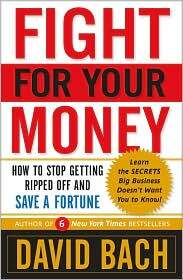 So in the case of Fight For Your Money, which is a book full of advice on how to make smarter purchase decisions and ‘fight back’ against companies that are overcharging you, we extracted dozens of tips and embedded them into a custom ‘savings calculator’ that allowed users to read a tip, act on it and then the calculator would show them their annual savings – and send a message to the user’s friends newsfeed announcing how much money was saved and encouraging them to do the same. We would also show how much money all Americans have saved by acting on these tips – creating a sense of a ‘larger mission’. We built several other applications that would function as a trigger for further viral messaging and engagement, such as reading a free sample chapter, downloading bonus content, RSVP’ing to tuning into a TV or radio appearance, etc. All measurable in its effectiveness to the marketer, of course. 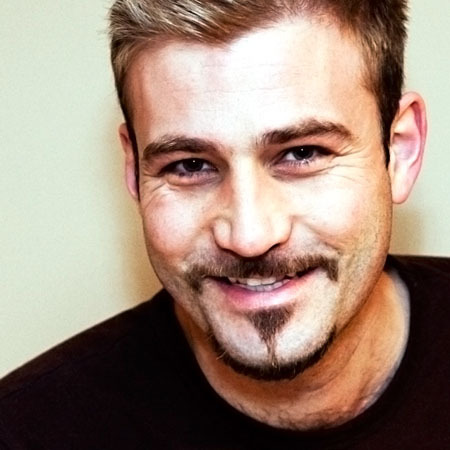 Our strategy for David Bach was to bring his book and the whole “Finish Rich” franchise to life in a way that allowed fans to take ownership of the brand and make the benefits of the David Bach “experience” tangible to both fans and (through viral channels) friends of fans. Also key to growing his fan base is to give the evangelists a voice and a medium – and when done right, these voices convert their peers in a way that a marketer couldn’t. Truth is, people trust each other, not brands and marketers. At the same time, social media makes the brand and its representatives more approachable and peer-like, a strategy that David Bach has fully embraced by engaging his fans both via Facebook and Twitter. FPP: What other applications does Broadway Books have planned to support the content of the book once it gets into customers’ hands? VB: We recently upgraded David Bach’s page to the new Pages for Brands product that Facebook offers, which we’re “tricking out” to the fullest to create even more engagement and virality. There are more custom applications for David Bach in the works that will further enable fans to share their story about how they are ‘fighting for their money’ using the David Bach brand as a symbol and reference point. FPP: In general, how can social marketing help book publishers better connect with readers? VB: First and foremost, book marketers need to understand and define their brand promise and readership. Then they need to quantify what marketing and business success means to them. This will help us narrow down the list of platforms and types of engagements that are appropriate. Secondly, publishers need to figure out if their role in social media is to engage directly with their readers or are they seeking to provide tools for reader-to-reader engagement? Social media isn’t a set-and-forget tactic, it’s a commitment, and publishers need to be realistic about what it takes to remain engaged over time. There is no one-size-fits-all approach to social media for publishers or other marketers. Creating a social marketing program is not necessarily as inexpensive as many have come to believe. A successful social marketing program requires expertise that spans design, usability, branding, advertising, technology and PR. It’s not something an intern offering to set up a blog is likely to pull off successfully. And finally, if you build it, they won’t come until you put some marketing dollars behind it. This entry was posted in Interviews, open publishing, publishing strategy, publishing technology, readership strategies. Bookmark the permalink. This is so helpful. I wish I had more time to learn all this stuff. Does the publisher have an in-house blogger and social media expert to set all this up? Thank you for your great talk tonight at the PSAMA Eastside SIG Tom. What a great way to kick things off. Thanks for the kind words. I had a lot of fun giving the talk and meeting everyone. It’s a great group! OK Tom – have you signed up on Twitter yet??? I’d hate to see you fall too far behind the curve ..